The Kannada Cell of JIH, Goa organized a training program on Saturday recently at Margao with the objective of developing communication skills amongst the kannada speaking cadre which are essential communicate Islamic perspective of issues in the society among the huge kannada speaking population of Goa. The program started at 10.15 AM with the recitation of Verses, 33-36 from Surah Fussilat, by Br.Ateequr Rahaman along with Kannada translation of the meaning of the verses. 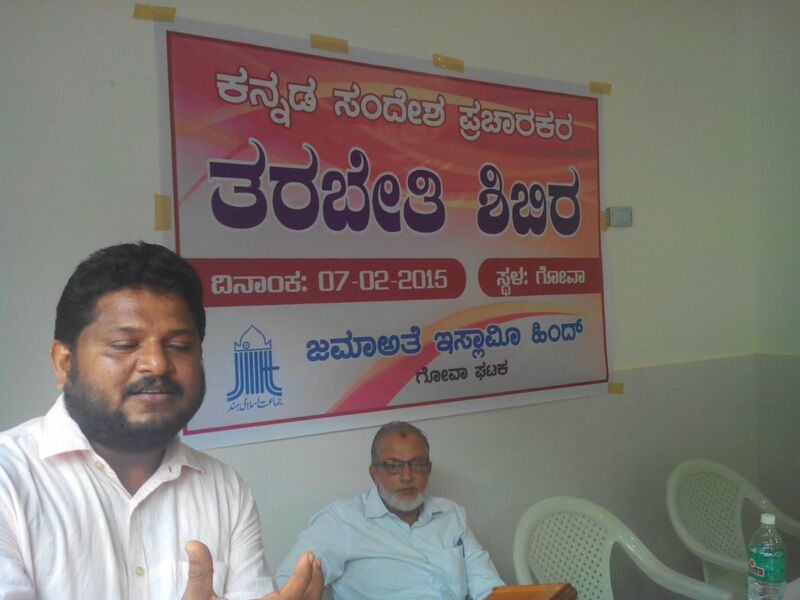 Janab Mohammed Ismail Sab, Convenor, Kannada Cell, JIH Goa delivered the inaugural address highlighting the efforts of the committee and the areas in which focused efforts are needed, during his talk he also quoted verses from the holy Quran to lay emphasis on our activism in the cause of Allah. The keynote speech on the topic” IMPORTANCE OF ISLAMIC CALL AND OUR ROLE” was given by the guest speaker & mentor of the program Janab Muhammad Kunni Sab, Administrator Shanthi Prakashana, Mangalore. Addressing a gathering of around 50 participants from Mapusa, Vasco & Margao the speaker In a style of his own & with the expertise of the kannada language mentioned that Islam has always been a challenge for the world in every era & the rest have done everything for their survival, hence Islam is natural to humans as it’s the deen of FITRA. Propogation of this deen to its stakeholders is our prime responsibility which we need to take it with passion & perseverance said the speaker from mangalore. Three short speeches of 12 minutes each were delivered by members of the Kannada cell based on the Book “SARWA DHARMA SAMABHAVA” written by Late Ibrahim Saeed Sab. Sabiha Saheba from Mapusa, Janab Mulla sab of Vasco & Saira Banu Saheba talked about the various aspects of different communities in our society in detail. The expert comments by Muhammad Kunni sab highlighted different dimensions of SARWA DHARMA SAMABHAVA and also appreciated the efforts of the speakers with a word of encouragement for improvement in the coming days . The open house interaction was coordinated by the Br.Ateeq for about 40 minutes in which various aspects of the development in the field of Kannada were taken up as assessment; questions of diverse nature ranged from what are the tips for doing effective dawah? How to develop fluent Kannada reading? How to understand the kannada speaking people and their different festivals? Multiple suggestions from the participants were noted for further consideration. The concluding speech by Muhammed Kunni Sab was but an inspiring & motivating one emphasizing the need of taking DAWAH seriously as an integral part of our lives. The various qualities essential in an individual as a Daee were not just mentioned but explained with examples by the learned speaker who stressed upon the quality of having genuine concern to save humanity without this deep pain for millions of people living in ignorance of reality of life. We cannot succeed in our propagation nor will our dawah efforts have any impact said Kunni Sab. Our approach of Dawah should be as per Prophetic way which was to present Islam in a smooth, simple and friendly way, ridiculing and Insulting others through arguments has not been the practice of the Prophet and hence we too should restrain from such practices. The objective of our dawah should never be to win an argument but rather our focus should be to explain to everyone the teachings of Islam with wisdom as said in the Quran. The specialty of Islam is that it never is subdued through pressure , human history has witnessed the growth & progress of Allahs religion in every era. If one door shuts down for Dawah another new opens up & we need to work through the new door tirelessly mentioned Kunni sab in his sharp eloquent way concluding with prayers onto Allah for granting all of us the required qualities in contributing towards the well being of human society.